Sarah Ann Smith is an art quilter. She makes postcards, journal quilts and art wall hangings. 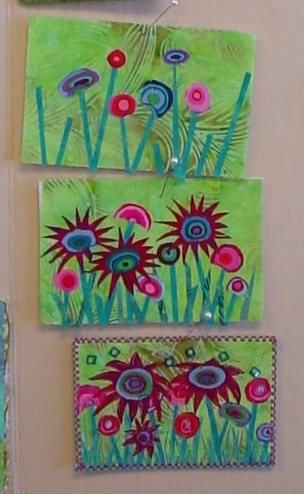 She uses fusing, beading, painting, and any other medium that works for her. Her work is beautiful. View a slide show of her work. Her lecture on beading showed the varying degree of which beading could be used on quilts, from very minimal to encrusted. 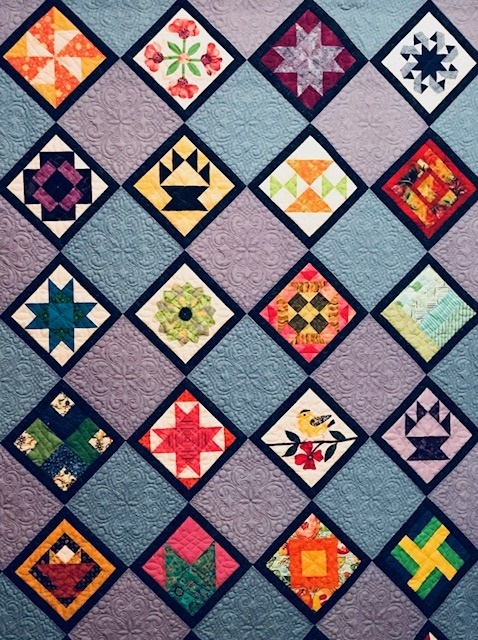 She considers herself a minimalist when it comes to beading her quilts. She likes to add just enough beads to give a little sparkle. 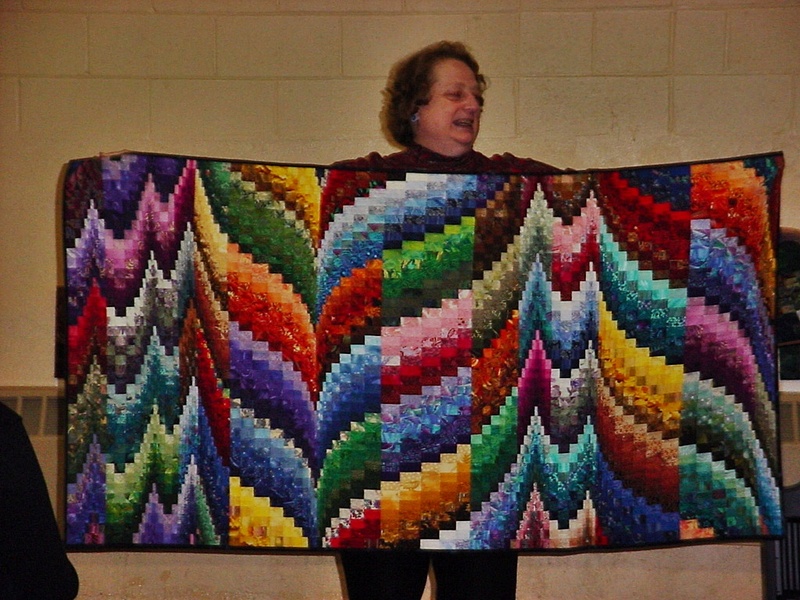 Sarah has a group of art quilting friends. Her and her friends help each other grow in their respective art forms. 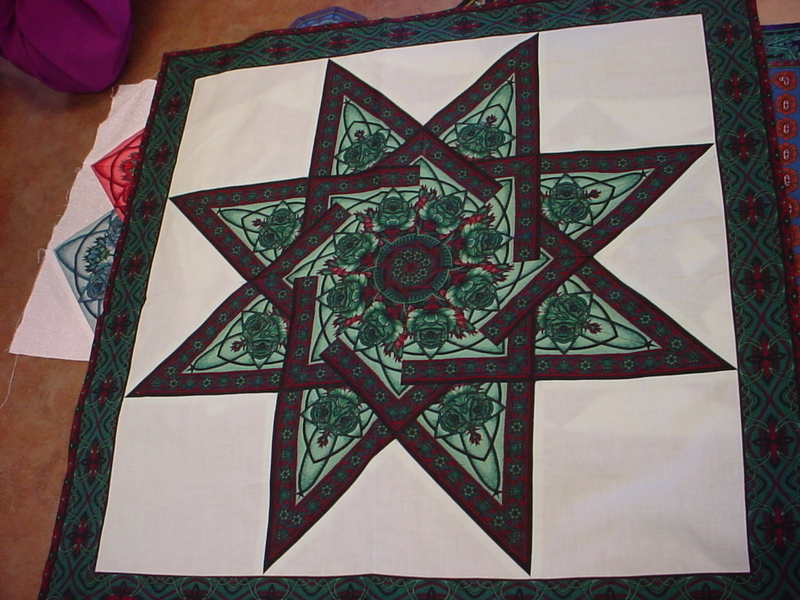 They like to use various mediums withing there quilting. This give each in the group a different way of looking at their own artwork. This group had a showing of some of their work. One of which, they each chose a picture. Then they each had to create a postcard/journal size quilt of all the pictures in the group. It was interesting how different yet similar each were. The workshop was titled “Postcards: An Introduction to Some New Techniques”. The amount of information we received was incredible. From how to assemble the postcards, to painting, to stamping, to finishing, mailing and displaying your postcards. There was such a wealth of information. Sarah covered which products she preferred. Peltex 70 is her choice for the stiff stuff used in constructing her post cards. Peltex comes 3 ways, no fusible, one side fusible,or 2 side fusible. She prefers the non fusible. That way she can assemble the design first then fuse it to the peltex. This way you can keep fusing items to the card without over stressing the fusible on the peltex. As far as fusible web she prefers Misty Fuse. It is a light weight fusible medium. If you are going to build up layers on your project, it doesn’t make it to stiff as some other brands might. Sarah went over the layering process of constructing your card. She showed an example of the layering process of constructing a design. Once she completes a top she quilts it before she attaches the plain backing. She found it easier to address the postcard when the quilting is not through to the plain back. I can’t even remember how many embellishment ideas Sarah covered. She demonstrated how to use this stuff call Angelina. It reminds me of the grass we put in Easter baskets, but much nicer. It has a metallic-opalescent quality to it. She demonstrated how you can bunch it up then using an iron and a stamp, press a design into it. Then you can trim it and use the resulting piece on you postcard. The stuff is really cool. The different ideas for using paints was phenomenal. She demonstrated how to create your own stamps using carving tools and either stamping medium or a simple gum eraser. You can also use automotive gasket making material or craft foam. Another technique was using a surface that has a bumpy design of some kind. Using a roller you could paint the item then use it as a stamp to add texture to a design. 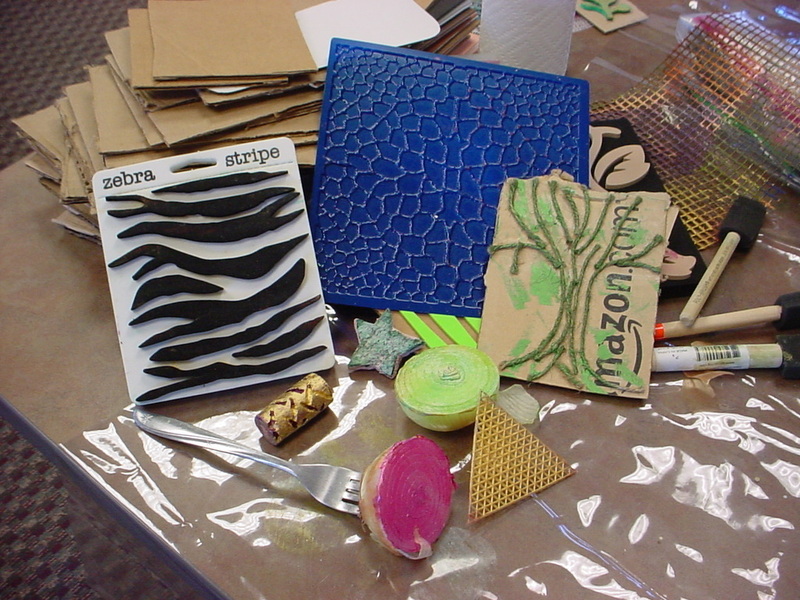 She talked about creating your own stamping designs with cardboard and hot glue or twine. You can also create a stencil from freezer paper. By cutting a design from freezer paper, then pressing it on to your fabric, there are no limits to the designs you can create. She showed us how tearing the paper can create a mountain/sky line effect or a natural looking branch. The trick with using the freezer paper is when you apply the paint, you want to brush from the paper toward the fabric. That way you will be less likely to get seepage under the stencil. She also uses bubble wrap as a stamp. Her message is to just look at what you have. You never know how it will turn out. But she did say to test it out on your fabric first. Until you get the result you want. Then fuse it to your postcard. Because you never know how it will come out, there is no sense in ruining your postcard. Once you have completed your card, you want to finish off the edges. 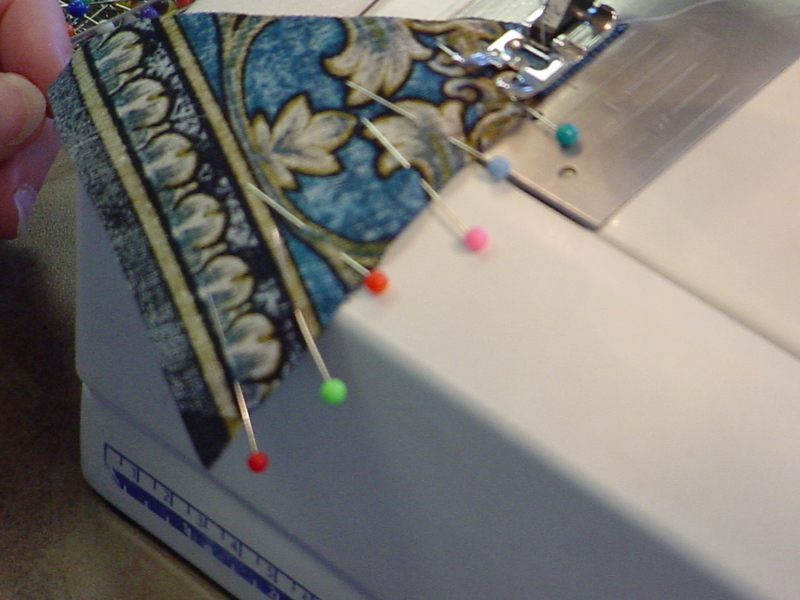 You can use a satin or zig-zag stitch along the edge. Sarah demonstrated how to apply a decorative yarn to the edge using a three step zig-zag stitch. 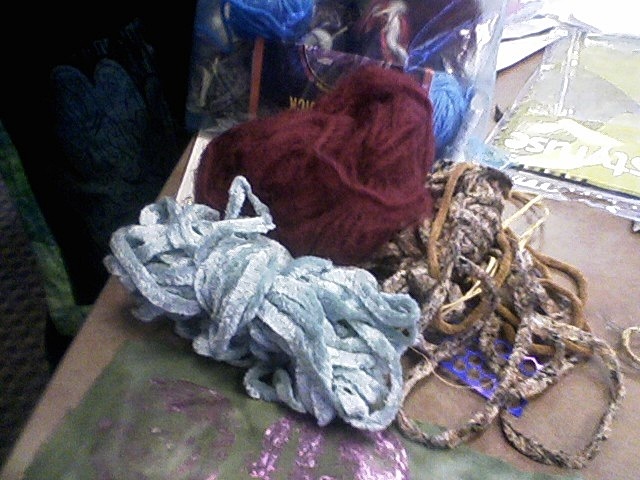 Sarah had various yarns to show all the possibilities. If the yarn is not heavy/thick enough to show, you can twist it with another yarn to give you enough substance to attach it to the postcard. That way you can use those pretty eyelash yarns. Sarah also covered some of her ideas of framing/displaying her postcards. She also discussed how to mail your postcards. Everyone enjoyed the class. There was so much information. Sarah was willing to demonstrate anything we were interested in. Here is a list of her product recommendations. If you were unable to take the class or wish to take more classes with her, check out her web site. She will be teaching at The Gathering in 2011. This entry was posted in Programs, Workshops and tagged Fabric Postdards, Sarah Ann Smith.